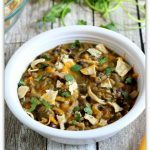 Lentils and chicken are pressure cooked with green salsa and black beans to make a creamy one pot dinner. Top it with cheddar, sour cream, cilantro and crunched up tortilla chips for the ultimate Mexican meal. Add lentils, broth, chicken, cumin, salt, garlic powder, chili powder, salsa verde and beans into the Instant Pot. Cover and secure the lid. Make sure valve is set to sealing. Set the manual/pressure cook button to 13 minutes. When the time is up let the pot sit there for 5 minutes and then move the valve to venting. Open the pot. Use tongs to place chicken on a cutting board. Shred the chicken*. Stir it back into the pot. Stir the cheese into the pot.